In the field of website design and content management the usage of WordPress is unimaginable. It is by far the most effective and efficient blogging and content management tool available today. In technical terms we can say that it as an open source content management and website creation tool which is written in PHP programming language. 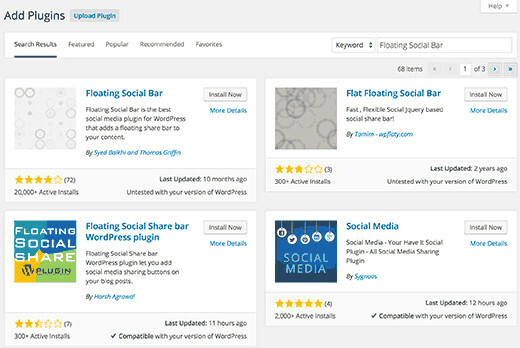 To enhance its credibility the WordPress introduces several additional feature to its standard CMS platform which can be added in the form of additional software updates known as plugins or modules. In this blog we will discuss about how you can install those modules and plugins on your WordPress dashboard so as to keep yourself in touch with the latest modifications. In order to install the various plugins of the WordPress you need to follow the steps mentioned here. Before installing any plugin you first need to locate it on the WordPress. For this you have to go to your WordPress admin, click on search plugin, then type the desired plugin and click on Add plugin as shown in the screen shots below. It shall be noted that only those plugins which are added in the WordPress directory are search able. After clicking on add plugin you will be presented with a install now option. You need to click on the install now button to start the installation process. Once you are done with installation you will be seeing a success message with a link to either activate the plugin or to return to the plugin installer. Once you click on the activation link in the message the installed plugin will be added to your WordPress CMS and you can then use the feature to enhance your web designing and content management. This method is for those plugins which are not installed through the above method as they are not listed in WordPress directory. The following screen shots will guide you in regards to this method. This method of installation is deployed in cases where your WordPress hosting provider may have some file restrictions that may prevent you from installing the plugins.The method is depicted in the screen shots attached. The various methods mentioned above can be deployed to install any new plugin of WordPress which you feel can enhance the effectiveness of your content management and website. We hope that this blog would come in handy in case you are facing some problem with your WordPress plugin installation.